Yes you read it write. Why I am using such statements? After reading my points you all will see things clear and for that you even dont need any lenses. Some may say its smart business strategy. But, I only want you guys to know facts. So that you can smartly deal with Lenskart.com. Before that small information about Lenskart.com. Its Delhi Based Sartup. Founded by Piyush Bansal. It operates in three major formats. E-Commerce (Website), HTO (Home eyecheckup & frame trial), Stores. 1) LENSKART FIRST FRAME FREE. 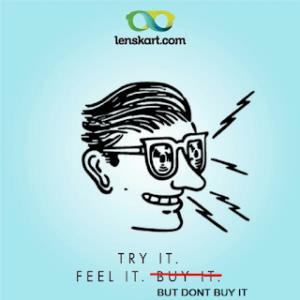 You all must be aware about Lenskart’s first frame free offer. But, in reality when you use any of Lenskart service you won’t be getting frame free. Indirectly you are paying for it. Because in stores and HTO service only frame is not sold you have to buy lenses. (most of people found hard to understand difference between contact lenses and lenses. Lenses are glasses fit in your frame. Combination of frame and Lenses makes you specs) So its just and marketing strategy. You do not get anything for free. Its to attract customers. Lenskart says on website and commercials. You can return your product if you are not comfortable with product without any questions asked from them. But, return policy is very hectic. Specially if you have purchased from HTO. (Home tryon or Home eyecheck) You have to take continues followup and answer lot of calls why you want to return the products. Some time it takes three to four months to get your problem fix. Its waste of time and money in addition you get frustration. Lenskart sales two major brands in frames. 1) Vincent Chase, 2) John Jacobs . Vincent Chase is sold saying its their home brand so it will cost you less. John Jacobs is sold as premium brand.If you compare both brand frame quality & designs you will not find much difference besides cost. John Jacobs is not world recognized or world class brand. Both brands are lenskart home production. If your buying specs from Lenskart.com only option you have in glasses are British Optics (BO). Again lenskart says that BO is home production. But when it comes to price its not that cost effective compare to other brands available in Indian market. BO is not internationally recognized brand but Lenskart will charge you amount will be same to internationally recognized brands. Besides they have other style to counter if customer ask for better brand. They will pitch them something called Tokia Nuroscience. Which will be three times of BO. It will only create hole in you pocket nothing else. 5) LENSKART ONLY PROVIDES HOME EYE CHECKUP. I would recommend never ever go for LENSKART HOME EYE CHECKUP if you love yourself. I am saying this because person who comes with huge bag and equipment are not certified optometrist. (Optometrist is person who can prescribe you with power and recommend you with suitable power glasses. It requires proper knowledge, Skills & Certification.) They are referred are refrectionist and have very less knowledge about eye checkup. If you don’t believe you can first ask for their certificates or some questions related to optometry. You will get your answer. Other thing lenskart hide from you is BOGO offer. On website they have BOGO offer. But they revel about GOLD membership at end while billing. Yes, to avail BOGO you need to pay additional 500Rs its only applicable for GOLD member. Its other way they misguide you and generate their leads. I will come up with more topics on lenskart.com. Lenskart.com is only big blown balloon. They make big statements offers. In return you get disappointment. You get much better deals in other local stores quality wise and also price wise. Its biggest scam in optical field at the end they are misleading customers. Home eye checkup is biggest failure. Other bigger brands than lenskart yet are not providing such home eye checkup service. They are serious about eye checkup. Lenskart take it for granted and send you with uncertified sales guy who’s aim is just to sale you high amount glasses. Tips to Care for Your Eyeglasses What is Computer Vision Syndrome (CVS)?